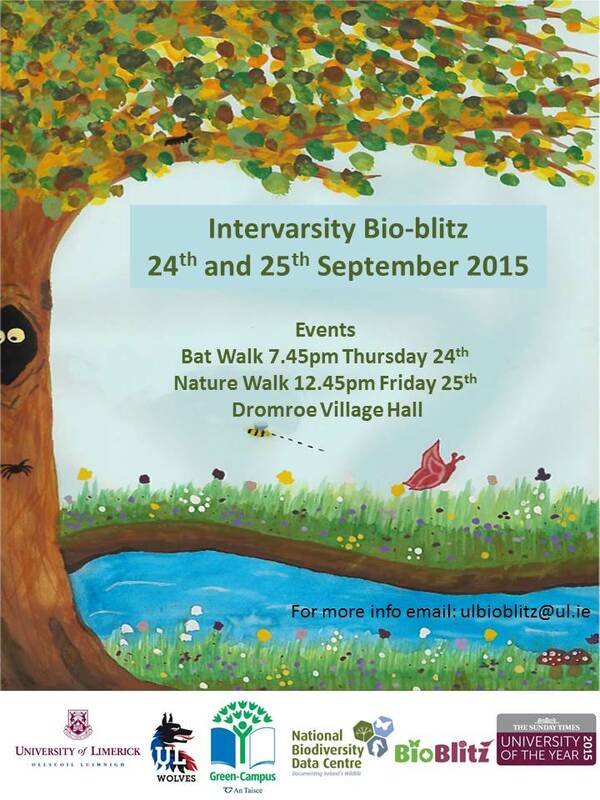 This Thursday and Friday UL is taking part in its first Intervarsity Bioblitz. UL staff, students and volunteers will work to record as many wildlife species on campus in 24hrs. While we are competing for the 2015 Champion BioBlitz title against Maynooth, UCC & NUIG this is about raising awareness of the wildlife biodiversity we have here on our beautiful campus. Anyone can take part in the UL bioblitz. If you see some interesting wildlife on campus, be it a bird, animal, plant or insect, photograph it, share it on Twitter or Instagram by inserting #ulbioblitz2015, give the name of the species if you know it and state you found it. To any botanist, zoologists, those of you who have inner David Attenborough ambitions who want to get involved please email ulbioblitz@ul.ie . We will need help over the 24hrs. Dromroe Village Hall is our headquarters so please call down if you are free. So what is a BioBlitz? It is a 24-hour event where teams of volunteers, scientists and students find, identify and record as many species of plants, fungi, animals, birds, insects and microorganisms possible in a defined area. It is a snapshot in time of an area’s biodiversity. Why a BioBlitz in UL? UL Environmental Committee want to raise awareness of the rich biodiversity that is here in our beautiful UL campus. It’s a fun event where scientists, students and the general public get together to learn how wildlife is studied and recorded. We will be competing against other colleges for the title of Intervarsity BioBlitz 2015 champions. When is it? It takes place from 5pm on Thursday 24th and September to 5pm on Friday 25th of Sept.
Where does it take place? The entire campus is our study area and Dromroe Village Hall is our control centre where people meet and the data is uploaded. Who can take part? All students and staff are invited to take part. We particularly welcome and need people, not necessarily UL members, who can record specific species types. The organising committee would really appreciate your help to identify and record the wildlife on campus. Please get in touch at ULBioBlitz@ul.ie if you can help out. How can you take part? Anyone can take part by simply using Twitter or Instagram to upload a picture of a plant, animal, insect or bird you see on campus, in the description insert #ulbioblitz2015, the name of the species if you know it and where you found it. You can even start now if you wish to practice. Image | This entry was posted in Uncategorized and tagged Biodiversity. Bookmark the permalink.